My brother and I have restarted our Friday Lunch Dates! After a few weeks off I was excited when he suggested we grab lunch together again. Neither of us were craving anything in particular, so I rattled off a list of about 10 restaurants in the area that we could go to. John narrowed it down to three and told me I had to pick. 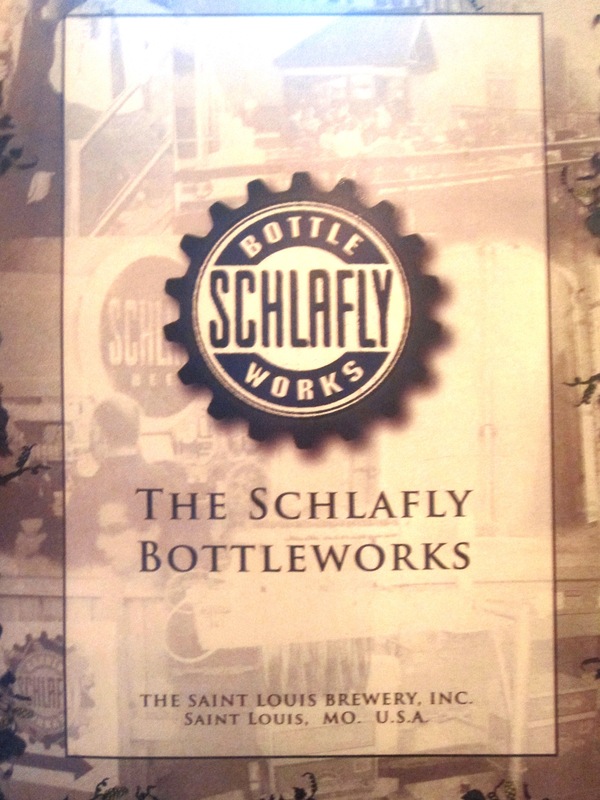 My options were Almonds, Nadoz, and Schlafly Bottleworks. Having been to all three before, I knew this meant I was either getting salmon and a salad, a crepe filled with egg whites and veggies, or a black bean burger. But at this point it was only 11am and I couldn’t decide between the three. John said I could just tell him when he picked me up. But when he picked me up at 12:30 I had only eliminated one restaurant. 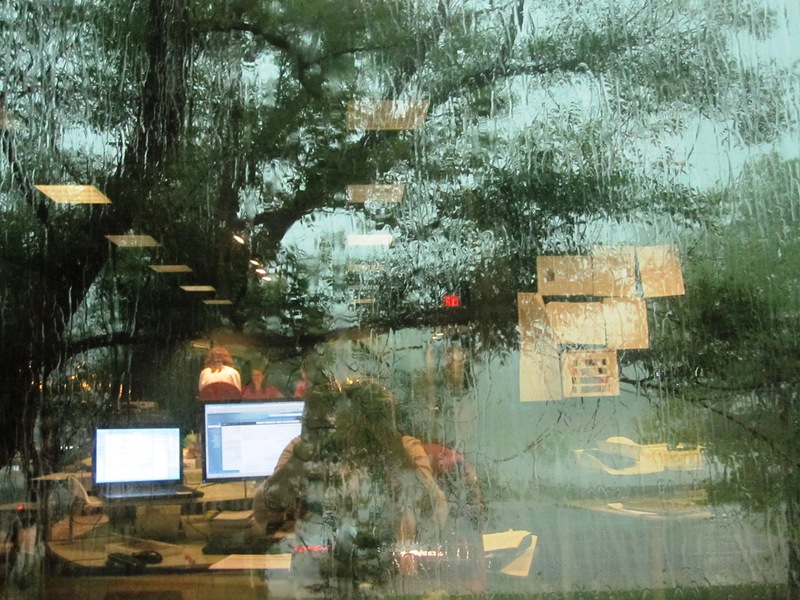 Almonds was a no go – it was pouring rain and I wanted something warm and comforting as opposed to a salad. We started driving in the direction of the other two but I was still refusing to make a decision. Finally John said “Pick 1 or 2”. “TWO” I reluctantly muttered, being a fan of even over odd numbers lately. 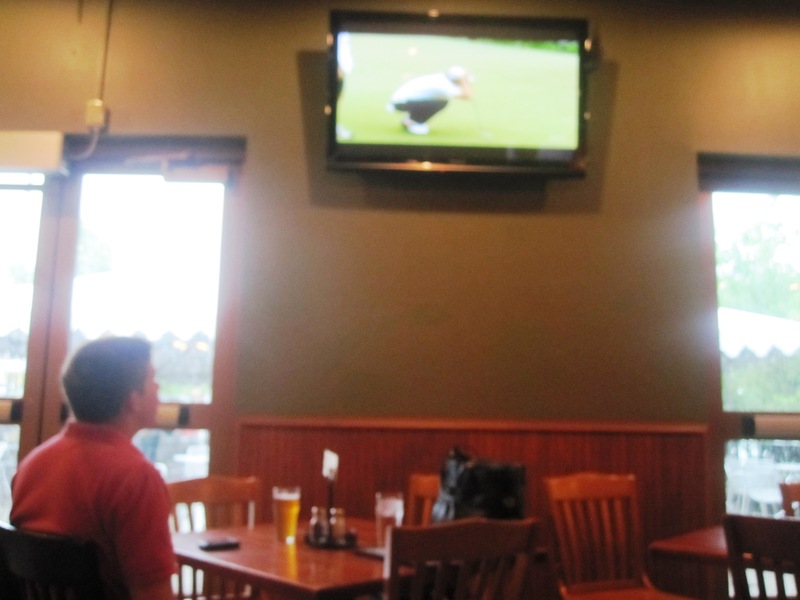 We opted to sit in the bar so that John could keep tabs on the U.S. Open while we ate. Because going out to lunch isn’t actually about talking to each other. Both of us ended up ordering the same thing we got the first time we tried Schlafly. John went with a pizza (he said the veggie sausage he got last time was better than today’s chicken!!) and I ordered their home-made black bean burger. I needed some redemption after yesterday’s veggie burger fiasco. 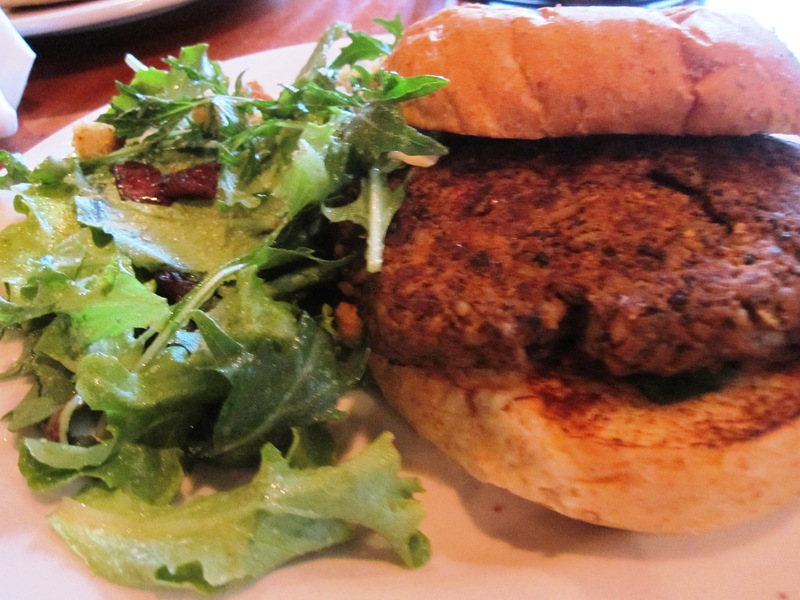 A handformed, not quite circular patty of chunky black beans and spices. What a homemade burger should be. I ordered mine without the cheese or aeoli today (wasn’t feeling it) and asked for a side salad instead of the tortilla chips. It was fantastic. The light lemony dressing they used on the salad was delicious and I loved that it seeped a little onto my bun to add a contrast to the savoury burger. It was warm and spicy and everything I was hoping for. John and I actually did talk throughout lunch. We had lots to catch up on between work, friends, moving , the lack of girl/boyfriends etc. It’s so nice to be friends with your siblings. Are you close to your siblings? How often do you see or talk to them? I have gone through phases with my two brothers depending on stages in life. I was closer to my younger brother when we were both at Notre Dame together, but now that I work back in St. Louis I am closer to my older brother. That’s so cute that you do lunches with your brother! I do lunches with my older brother too now that we are both in SF but I was just telling him that it’s been a while and we need to do them again too! I love being friends with my siblings and now that I’m older it’s nice for my brothers to finally see me as an adult! Did you have that problem too? 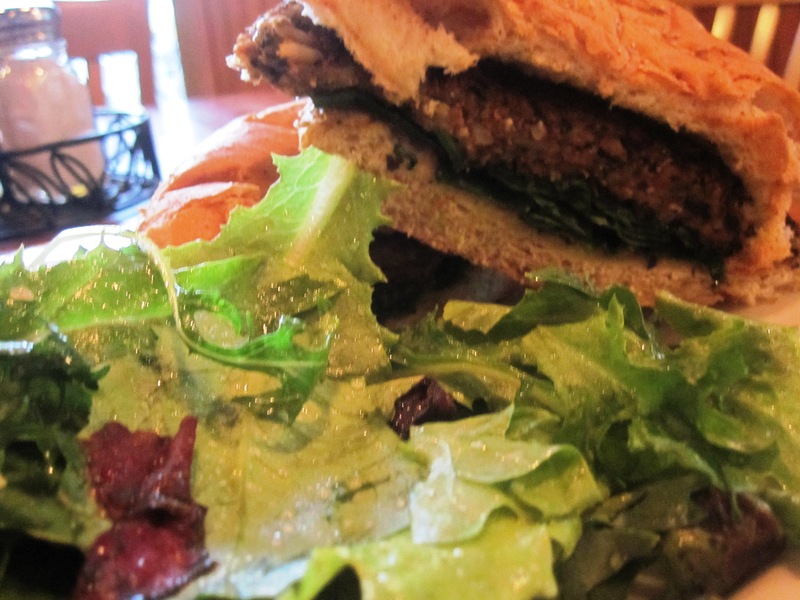 And mmm your veggie burger looks delish- much better than yesterday! That’s great. I’m pretty close to my brother, but we don’t do a lot together since I live away from home. It might change when I move back, but he’s just starting college so….yeah haha. We’re 6 years apart though! What’s the age diff. with you guys? I wish my older brother and I lived closer together! We used to fight a lot when we were younger, but now we are best friends. It’s so fun having such a close relationship with siblings! Yum that blackbean burger looks so tasty! Sadly, I’m not really close with my brother, but we’re working on it. Congrats on your move to Dallas by the way. I just moved from from there about a year ago and I lived there for about 12 years. Get ready for the heat!!! Both of my (younger) brothers live only a few blocks from me, and I see them weekly. More in the summer since we have BBQs at our house together! I would say we have gotten closer in recent years since we are all “adults” now. Before since I am 6 & 9 years older than them I was more of a Mom versus sister, and I also moved out when they were young to go to University. Veggie burger win too! 🙂 sounds like you are having a great day! I only have step and half brothers and sisters. I am definitely closer with my sisters but we don’t really do anything together ever since we live in different towns. I wish we were closer. My brother and I are friends, but don’t talk that often. I feel like it’s harder to keep in touch once someone gets married, even though I love my sis-in-law! Yay for delicious veggie burgers 🙂 I really wish that I was closer to my little brother, but he’s eight and lives with my dad more than 800 miles away! I hope that when he gets older, we’ll be able to talk like you and your brothers! Newbie to your blog here! I am really close with my brother when we’re both at home. Unfortunately I don’t live at home, so we NEVER talk throughout the year. A bit sad! My sisters and I have our days. My middle sister and I were really close when we were little, but now our personalities clash at times. My youngest sister and I get along, but we’re five years apart, and slowly finding that we have more in common- she doesn’t enjoy that fact that I still (and maybe always will) think of her as “the baby”. I think we’ll all get along better as we get older.